Replace OSPF area 0 configured between R5 and SW3 with OSPF area 59. Advertise SW3 loopback0 into OSPF area 300. Ensure full OSPF connectivity given new design. What does OSPF virtual Link do? Are 'hellos' sent over virtual link? What are limitations of using OSPF virtual link? 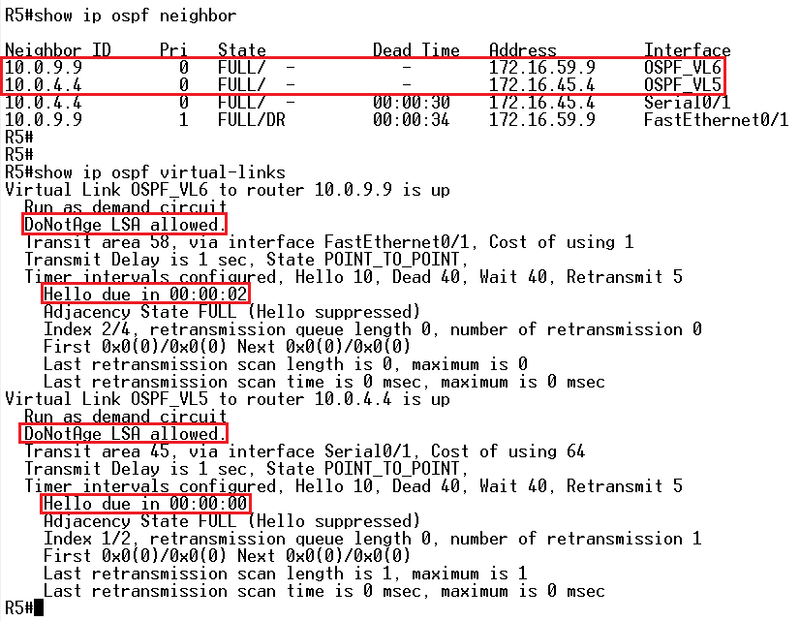 Does OSPF send 'hello' packets over virtual link? What is the alternative to virtual link to connect separated OSPF areas to area 0? In order to connect area 300 to the backbone area (area 0), two virtual links had to be configured: first, between R4 and R5 (making R5 new ABR), then between R5 and SW3, so that the loopback of SW3 (10.0.9.9/32) can be propagated to the rest of the OSPF domain. Pic. 2 - R5's Two Virtual Links. Pic. 3 - Ping Test from SW3 Loopback0. OSPF virtual link is extending the area 0 (backbone area) providing virtual point-to-point path between two ABRs. We must remember that we cannot create a virtual link over a transit area that is stub. Transit area is the one over which we create VL. Virtual link is not used to send hello packets. Also, LSAs learned via VL are not aging as learned in a traditional way (DNA='do not age' bit is set). LSA types 1,2,3,4 from area 0 are exchanged using VL, but LSA type 5 are not. LSA type 5 (external) have scope of domain (not an area), so this explains why a transit area cannot be stub. If a transit area (the one we try to use to get to area 0) is a stub area, alternatively we can patch the network using GRE tunnels (we will use that method in some future lab). 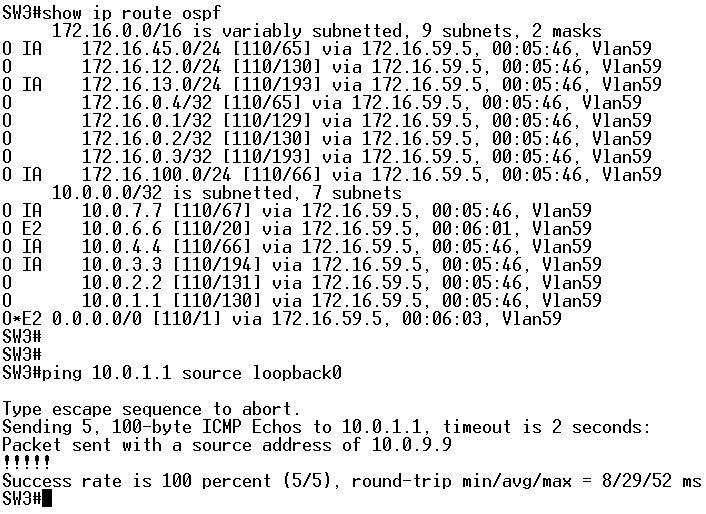 As for the hello packets, after VL has been configured using router-id of connecting devices (not their real IP addresses), the intra-area shortest path is calculated and the 'hello' packets are exchanged (using 'unicast', not multicast). After discovering the new connection using VL, normal LSDB exchange is performed.